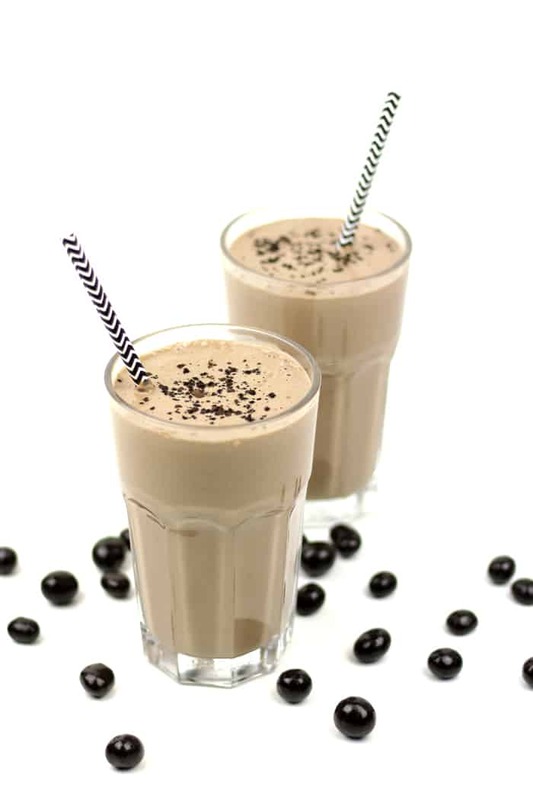 Vegan Mocha Latte Smoothies are a healthful way to begin the day. 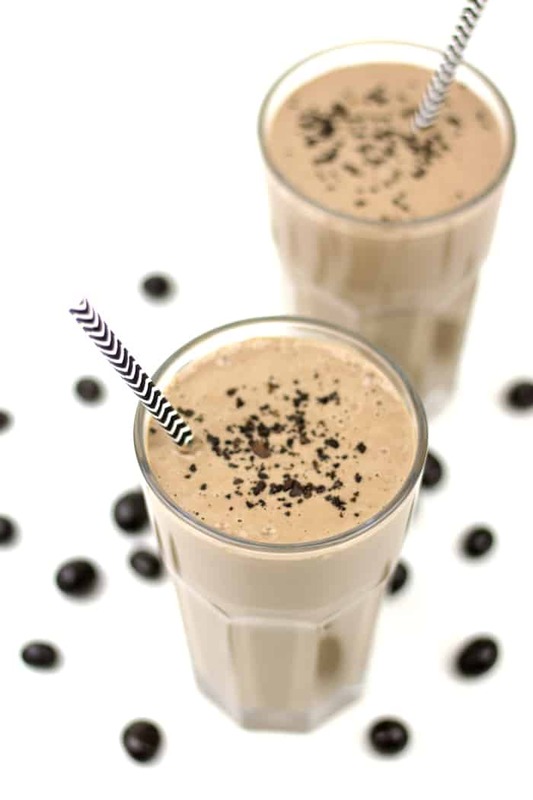 Packed with protein and nutrients from bananas, peanut butter, non-dairy yogurt, almond milk, chia seeds and tofu, this smoothie’s got a bit of caffeine from real cocoa and coffee or espresso to boot. This is a blender breakfast that’ll boost your morning right. Raise your hand if you’re a morning person. …Did anyone notice I didn’t raise my hand? Yeah — I never have been. Might not ever be. I don’t have to decide right now. But thank goodness for coffee. It wakes me up! Not being a morning person often means I’m not a breakfast person. But New Years’ resolutions are in full effect over here, and I’m trying to be better about getting in a bite or two of the most important meal of the day along with my morning cup of coffee. Lately, there’s been a lot of smoothies. 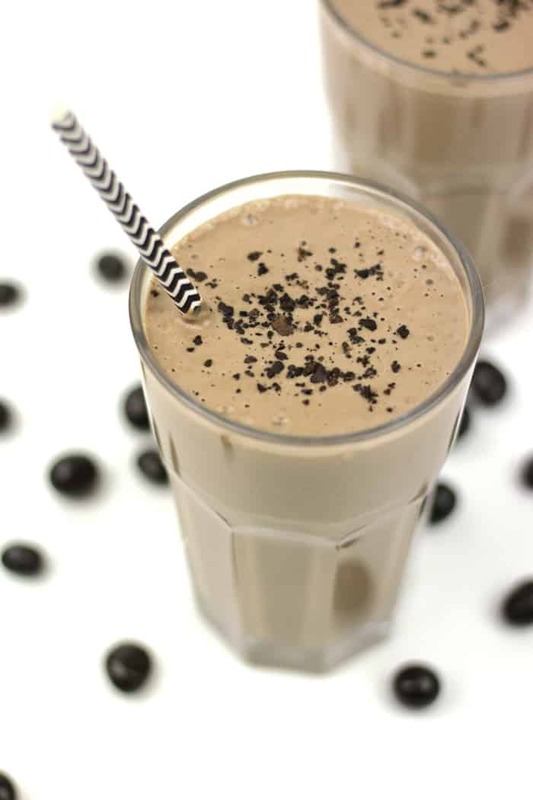 Most days, I make a Chocolate Peanut Butter Power Smoothie. It’s my favorite. Sometimes I’ll do a smoothie bowl with lots of toppings, like this Green Smoothie Bowl. I also like fruity smoothies on occasion, like this flavorful Winter Sunrise Smoothie. 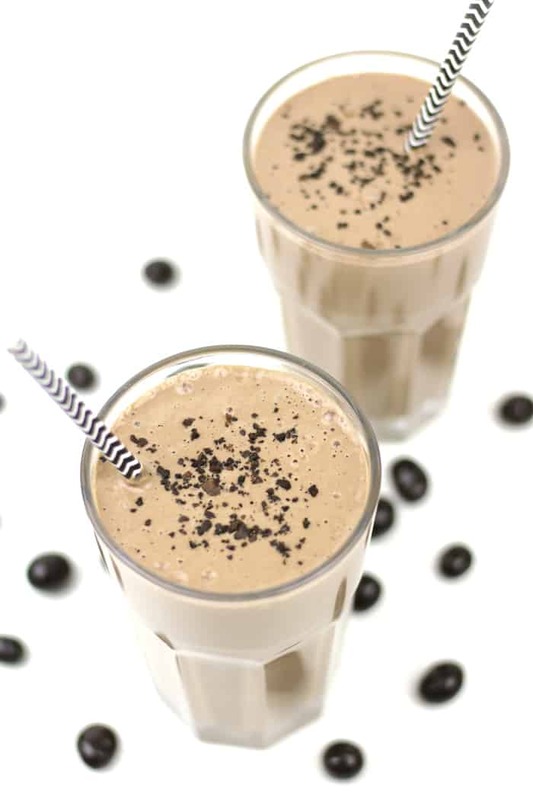 Last week I added this Vegan Mocha Latte Smoothie into the rotation. 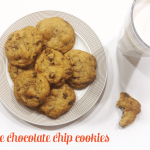 It’s got coffee already in it, as well as a heaping scoop of cocoa powder for a punch of chocolate flavor. This baby is packed with nutrients. I added banana for potassium and magnesium and peanut butter for protein. I also threw in a spoonful of chia seeds for fiber, protein and Omega-3 fatty acids. There’s even a little bit of agave nectar for a sweeter taste. 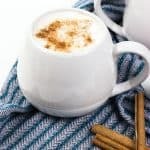 My favorite addition is a cube of tofu, which is filled with amino acids, protein and calcium — and it makes the smoothie extra silky. I am so picky about my smoothies. I like them to be super smooth, but I don’t like when they’re too thin and runny. I also really hate chunks. Thin, runny, chunky smoothies totally gross me out. In college, I had an abysmal, cheap blender that turned me off smoothies for a while for this very reason. Thus, it’s important to me to have a really good blender. 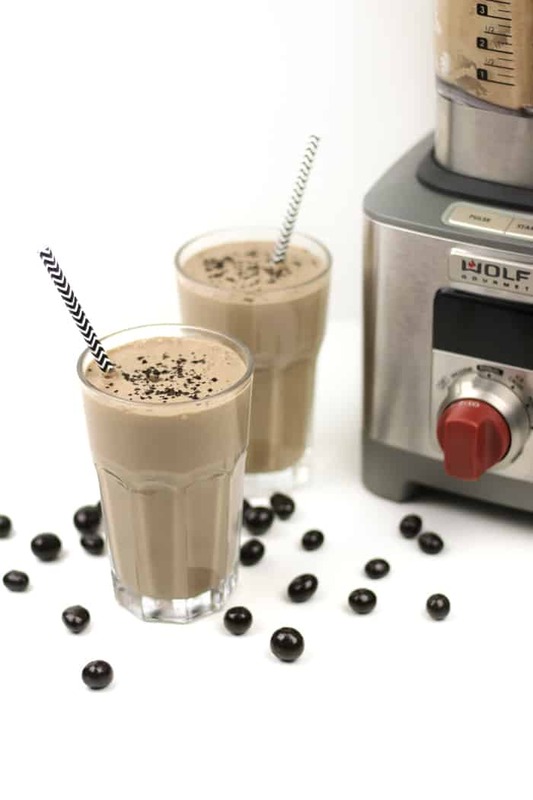 I love love love my Wolf Gourmet High-Performance Blender. That’s not an ad, though Wolf Gourmet has sponsored posts on Feast + West in the past. I just seriously love this thing. It has so much power and it makes the smoothest-ever smoothies. 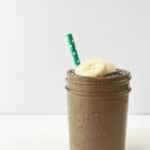 This Vegan Mocha Latte Smoothie is great for waking you up in the morning and sending you on your way with lots of protein and nutrients. 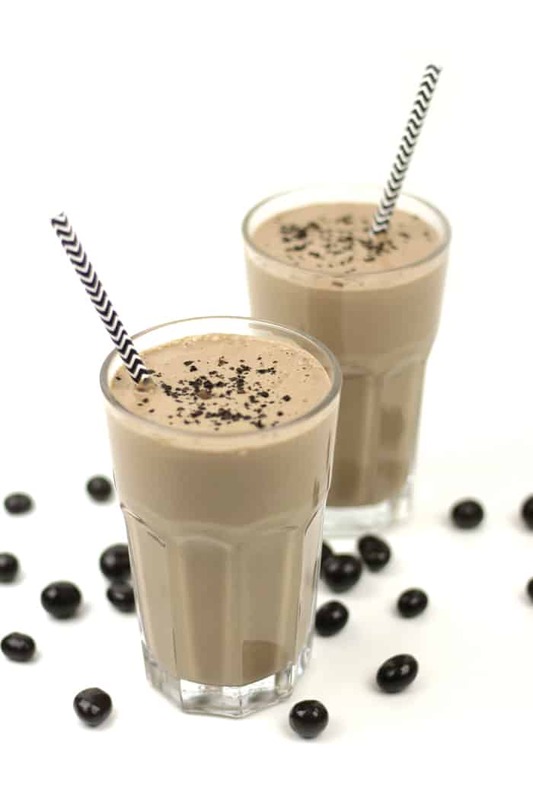 Vegan Mocha Latte Smoothie are a healthful way to begin the day. 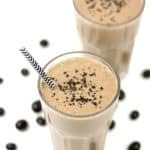 Packed with protein and nutrients from bananas, peanut butter, non-dairy yogurt, almond milk, chia seeds and tofu, this smoothie’s got a bit of caffeine from real cocoa and coffee or espresso to boot. This is a blender breakfast that’ll boost your morning right. 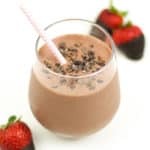 In a blender, layer the banana, yogurt, tofu, peanut butter, chia seeds, cocoa powder, coffee, almond milk, agave nectar (or maple syrup) and ice. Blend on high until smooth with no chunks remaining. Pour into two glasses. Garnish with a pinch of coffee grounds if desired.